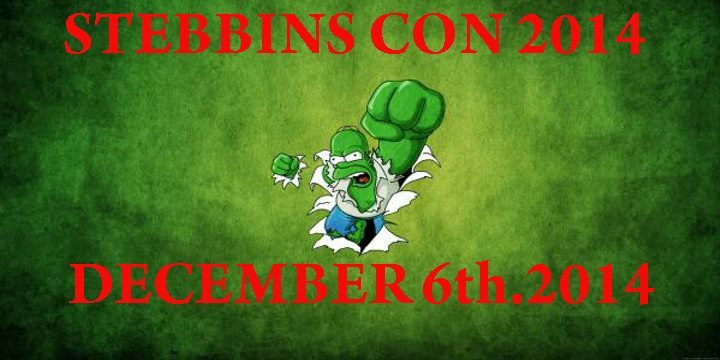 The Uncommon Geeks go to Stebbins CON 2014! Over the weekend, The Uncommon Geek site had a table at a small convention called Stebbins CON being held at Stebbins High School in Dayton, Ohio. This was the first year that we’ve heard of it, and we decided to give it a shot! Small. Intimate. If you are a fan of comic conventions that have that old school comic con feel, then this is the local con for you! When we walked into the Student Activities Center where the con was being held, it reminded me of the feeling I had when I was walking around Gem City Comic Con and Derby City Comic Con; It’s all about the comics! Yes, they had other non-comic vendors selling things, but when you walk in, you see glorious long boxes full of comics just ripe for the picking! Being next to people who have the same interest as you and who are there for the love of the culture! When we were unloading, I looked to see who our table neighbors would be, I was excited! Our booth was set up right next to World paranormal Investigations! As some of you may know, I am a photo-analyst for them. John, the head of WPI told me about some of their more recent investigations, and let me tell you… I wish I could have been there for some of them! We weren’t the only podcast there. We met one of the hosts of the Basement Fodder Podcast! They are from the Columbus, Ohio area. We traded business cards, of course! They were doing a live show, and I inadvertently was able to get on one of their episodes for a moment! We are going to hopefully do some cross-promotional stuff soon! Their was a live bad as well. One I have heard of, but have never been able to see them. Team Void was the live entertainment! They are a surfer sound style band who wear lucha type masks as part of their personas. they were pretty good! If you enjoy surfer sounding music without lyrics, then they are right up your ally! But, Stebbins CON wasn’t all about comics. The convention is also a fundraiser for Stebbins High School’s music department! I am a firm beliver in supprting the arts in school. I was in choir in middle school for two years and enjoyed every minute of it, and one of my favorite classes in my entire public school career was art class. Creativity helps younglings find themselves through creativity. If you find out what you are able to create, then that can be a windo into parts of yourself that you never knew were there!